If you are a bike enthusiast and perform repairing and maintenance work on your bike rather than running to and fro or to the local shop, then a High-quality portable bike repair stand is a must for you. Because a portable repair stand is foldable and easy to store, so you can carry it freely and do your work whenever you need. It’s not easy to hold a bike and work on it that takes a lot of energy and times. But the repair stand will save your time, and you can easily wash, install parts and finish other maintenance comfortably. There are many types of bike repair stands in the market. That may confuse you to find the right one. We have analyzed various repairing stand and got some best bike repair stands for you. Here are the reviews of the best-listed bike stand in the market. If you are looking for a professional bicycle repair stand, then Cycle Pro Mechanic repair stand will be good for you. This repair stand is famous for its durability and versatility. The manufacturer company Bikehand is renowned for its innovative well-developed products in the market. This repair stand is portable, and you can carry it easily wherever you go. Also, it comes with a compact package of simple design, sturdy body, height adjustments and tools tray which will put you at ease at the time of repairing. Weight limit is 25kg or 55.1 lbs. Overall, The Cycle Pro Mechanic bicycle repair stand is a budget-friendly compact product. You can easily place the product anywhere and the two legs pole support the body very well and keep the balance while working. For random uses, this bicycle repair stand will be a better choice. Let’s move to our next product which is from Feedback Sports. This brand is famous for its evolving product process in the sports field. Feedback Sports Sprint Work Stand is a euro-style traditional fork mount work stand, suitable for any kinds of a fork and rear support. This bike stand is a professional work stand for washing and repair. Remove the front wheel and put your bike front part on the metal structure and lock it, then put the rear side. 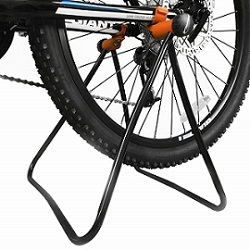 The metal base will help you to secure your bike front and rear in position. The best part is you can lift the back freely without unlocking the bike front and spray or clean the rear section. 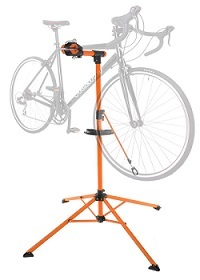 This repair stand is a small foldable and quick, manageable work stand. Those who love traditional fork mount repair stand, it will fulfill the thirst with its outstanding design and performance. In short, Feedback sports stand is a high-quality repair stand because of its compatibility and well-built structure. You can easily adjust and lock the position as per your needs. The tripod legs are the best feature of this product, and you can quickly narrow or spread the legs in small or broad space while working. So, it will be a good choice if you are considering a higher price. Park tool repair stand secures your bike at the right height adjustment and will put you at ease when you do your maintenance work. This stand is a well-built product for your maintenance work. The clamp, height, Flexible body and quick release enhance its efficiency. This stand is a convenient repair stand from beginners and to pro users. Its cam-type clamp fits with any size tube which is a very positive side of this stand. Park tool repair stand is suitable for thick, aero shaped frame tubes. You can rotate the clamp 360 degrees for easy access to the parts. This stand is height adjustable to 57 inches. 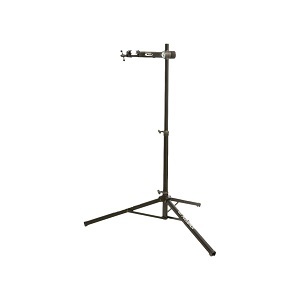 This repair stand is easily foldable, and its 3 point leg is sturdy and durable. This Park Tool repair stand provides you the best way to do your repair work comfortably, and its portability helps you to carry it anywhere you want. Can take the load of 80 lbs. 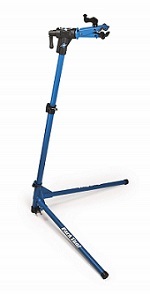 Park tool PCS-10 is a simple repair stand with many qualities. If you worry about setting bike tube and height adjustment, then this park tool PCS-10 will remove that with its clamping design and quick release and 57″ height adjustment option. This classic repair stand has got the hearts of many users. For home mechanics conquer portable home bike repair stand is a perfect stand. This repair stand designed for users comfort and easy maintenance without any hardship. The stand is manageable while working on your bike and you can freely access your tool kit with its handy tool tray. The tool tray has holes and broad space so that you can put your wrenches, screwdrivers and other tool kits. If you are facing height adjustment problems, then it will reduce that because you can expand height to 6 feet and you can reach to the down parts easily. You can smoothly finish your bike washing and repairing using this conquer portable home bike repair stand. Maximum weight limit is 50 lbs. Conquer portable home bike repair stand is very flexible and durable stand. You can comfortably lock your bike position and rotate the clamp head and adjust the height which is necessary for bike maintenance. Whether you are looking for a good quality repair stand at a reasonable price, then this repair stand will fulfill your necessity. A repair stands performance depends on materials and Yaheetech Pro mechanic bicycle repair stand manufactured with high-quality iron and PA. This pro bicycle repair stand makes your maintenance efficient and is the right choice for all the bike enthusiasts and repair shops. 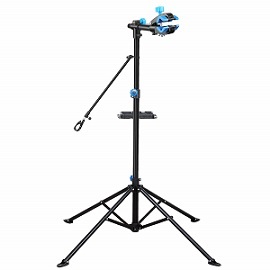 This Yaheetech pro repair stand is very convenient to use in a sitting or standing position. The 360-degree rotation and height adjustments are very smooth, and you can move your bike comfortably. It has a handlebar to hold your bicycle still at the time of working. The plastic clamp is easy to lock and protects bike paint. The body structure and set up is convenient. It comes with a tool tray and four legs which is foldable quickly. The four legs support the body strength and have plastic cover at the bottom that reduces the harsh metal sound on the floor. In short, Yaheetech Pro mechanic bike repair stand is a compact package of quality, performance, and durability. This repair stand is very comfortable and can be a good option as per the value. If you are looking for a simple, not heavy working bike repair stand then Ibera easy utility bicycle stand is here for you. This repair stand is perfect for working on wheel, chain and other gears. Ibera bicycle stand is a small folding stand where you can put your bike tube on the adjustable mount which holds up your rear wheel, and you can do your work comfortably. You can spread the stand using the knob and quickly fold it after work. In a word, this repair stand is right for light maintenance work. You can use it to display your bike as well as parking it wherever you want. Can tune the gap between chain stay mount from 3.5″ – 4.25″. Therefore, Ibera utility bicycle stand is ideal for multiple uses like changing gears, washing and also best for parking or display the bike somewhere. This bicycle stand is handy for home mechanics to maintain their bikes. RAD cycle products brought to you a new versatile pro bicycle adjustable repair stand which makes your repair work more accessible, and it has a high-quality clamp that holds your bike well also the handlebar will keep your bike stay still. You can put your bike tube on the head body clamp and set it twisting the knob. Even you can increase the height as you want and lock the position using the knob. 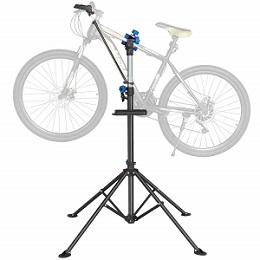 This pro bicycle adjustable repair stand is easy to set up at any place. The four feet has a plastic cover to protect the rod, and you can fold the leg quickly. Furthermore, the clamp rotates freely and assist you in reaching each part of your bike. Besides, it comes with a tool tray for keeping tools while working. However, this stand is very convenient, and the workhorse clamp holds tight without damaging bikes finishing. 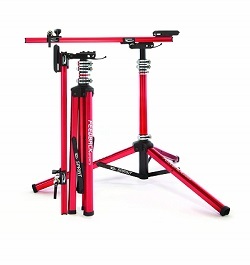 RAD cycle pro adjustable repair stand is a perfect package within a reasonable price. Here, we have another repair stand from feedback which is Feedback Sports Bicycle repair stand. This tripod style stands to assist you in working on uneven space and keeps your bike stand still. Also, the rubber foot caps are high in quality. This Sports mechanic bicycle repair stand has spinning knob clamps to lock your bike. You can open the clam 19 to 48 mm, and this is suitable for most of the bikes. This repair stand is a well-constructed product with aluminum body and plastic clamp covered with rubber which doesn’t cause any harm to your bike. Besides these features, Feedback Sport bicycle repair stand is freely usable in indoor and outdoor. This bike stand is a durable and high functioned repair stand for working or washing or repairing. No cam-style quick release clamp but the twisting knob is not stiff or tiresome. The knob tightens the clamp well. 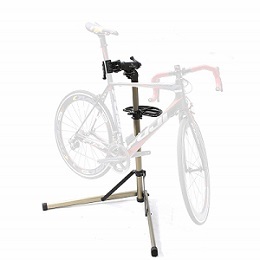 However, Feedback sports mechanic repair stand is portable, well-constructed high performing repair stand for your bicycle. For repair stand, we always want a stable, durable bike stand which supports for a long time. Flexzion bike repair stand is a heavy duty constructed stand made of high-quality material for high performance. If you have a regular or entry level mountain bike, then you need a stand-in which you can adjust your bike height and load weight of the bike. This Flexzion stand is freely adjustable and can take pressure up to 30kg. The repair stand has telescoping feet, handlebar rod to keep fixed in the position. Moreover, the rotating clamp helps you to reach every part while maintenance and the tool tray is quite useful to organize your tools in place. Has a tool tray to arrange tools. Flexzion repair stand is a well-designed stand that opens and folds easily. Overall, the heavy-duty construction, and you can place it comfortably in any rough or smooth base while doing your work. 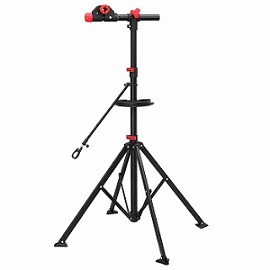 Songmics Pro mechanic bike repair stand is a light-weight telescopic portable stand for bike maintenance. This pro stand tubes built with premium iron and the stable plastic clamp secures your bike’s finishing well. This Songmic Pro mechanics bike stand comes with telescopic four feet, tool tray, rotating clamp and adjustable handlebar. You can set the clutch head back and forth twisting the knob. The handlebar keeps your front wheel stable, and it has a strap with holes to lock it tight. You can easily adjust the height with the quick release lock as well. The 360 degrees clamp rotation allows you to work comfortably without bending and moving much. Furthermore, this pro bike stand holds your road bike and mountain bike easily and solidly. Can support bikes up to 66 lbs. 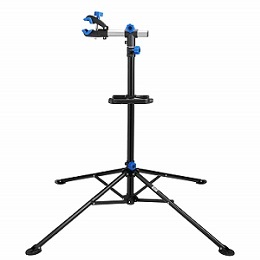 The Songmics Pro mechanic bike stand is easy to assemble, and the high-quality materials increase its duration. This bike stand is heavy duty and strong repair stand that gives high performance within an affordable value. Bike repair stand is significant if you have a regular or mountain bike. A repair stand saves your time, and you can easily carry it with you. But before buying a bike repair stand, there are some things that you should consider to choose the right one. Always consider the height of your bike before buying a stand cause If the repair stand height adjustment doesn’t match your bike, then the money will go in vain. Some stands height is adjustable up to 72 inches which are suitable for most of the bike. So, while buying the repair stand check how long you can adjust the height. Select a stand that can hold your bike well. If the repair stand can’t take the weight of the bike, then ignore that and choose a bike stand which clamp will keep the bike tight and won’t cause any damage to it’s finishing. Most of the repair stand can hold maximum 60-80 lbs. Therefore, you can compare the weight and get your bike repair stand. It is significant to move your bike at any angle cause that will help you to reach any part. If the clamp is flexible can rotate in 360 degrees smoothly that will be a great choice. So, get the repair stand which has the highest rotating option so that you can freely wash or maintenance the bike. A well-balanced bike stand assists you in finishing the work quickly and comfortably. There are different styled repair stand like two legs, tripod and telescopic style. A shaky bike stand may ruin your day. So, you must choose a heavy duty repair stand for the bike that can maintain regular and mountain bike. Bike stand clamp needs to build with high-quality material. The metal clamp can take the heavy load very well, and the plastic clamp is also high in quality. Some clamp has a rubber cover inside so that your bike colors and structure stay secure while working. You can adjust some clamp head back and forth unlocking the knob. Think about the clamp size and width if that can adjustable with your bike tube then you can operate efficiently. Most of the companies provide a tool tray with the bike stand. You can organize your tools on the plate. Plastic and magnetic tool tray are very common. If you don’t get a tool tray with the product, then you can buy it separately. While working on a various space like even-uneven, narrow or wide, you may face a problem if you get the wrong repair stand. Two legs stand sets in small space or corners on the other hand tripod, and telescopic feet need a bit more space and can stay balanced on an uneven surface. Thus, consider working areas while buying a repair stand. The portable repair stand is a must for home mechanics cause it’s easy to carry. Whether the repair stand parts fold easily and can store in a short space that will be a better choice. If the repair stand is stable, then it will last longer. Find a durable, sturdy bike within a reasonable price. Cheap products will not work for a long time rather than wasting money, choose wisely. You should consider the price before buying a repair stand. Compare products quality and pay for the right products. If you need a high-quality product, then you may pay more, but that’s a wise decision than getting a cheap product at a low price. Overall, a bike repair stand saves your time helps cleaning and other maintenance work without any trouble. Also, you can take it with you wherever you go. And for all these benefits you need to choose a professional bike repair stand among the vast collections which is hard without any knowledge about a good repair stand. In this article, you will find ten best bike repair stand reviews with pros and cons which will help you to compare among those products. 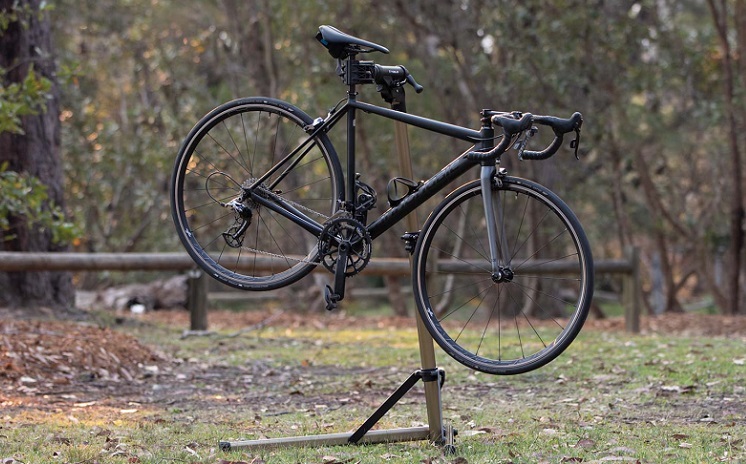 It’s difficult to find the perfect repair stand without knowing what you should keep in mind while selecting a bike stand, but through the reviews and buying guidelines, you will know what to look for to get a right bike repair stand. Thanks for staying with us.